Researchers from the French National Center for Scientific Research and NextPV, a French-Japanese laboratory, are looking into a new way to generate solar energy. The research team, lead by Jean-Francois Guillemoles, director of the French National Center for Scientific Research, believes that solar power could be generated without having to account for weather patterns. Weather can play a major role in solar energy generation, as storm fronts can block sunlight, thereby making solar panels much less productive than they can be. The research team believes that balloons could be the answer to the weather problem. Guillemoles suggests that balloons equipped with photovoltaic technology could be sent into the air, allowing for the collection of sunlight and the production of electrical power. Clouds may not present a problem for these balloons, as they can simply rise above the cloud layer and take full advantage of the sun. NextPV is currently experimenting with lightweight polymers that would be used for such balloons. Other companies have experimented with a similar concept, though they did not focus on solar energy. In 2013, Google launched an initiative called Project Loon. This project aimed to use a series of balloons to provide Internet access in remote regions. These balloons hover approximately 20 kilometers above the ground, and are, notably, equipped with solar panels. While Project Loon was not focused on solar energy specifically, it did show that using balloons to capture solar power was possible. Solar balloons may be best suited for providing electrical power to remote communities. In developed countries, utility-scale solar energy systems may be able to adequately handle the demand for electrical power. In developing countries, however, utility-scale projects have had trouble taking form. 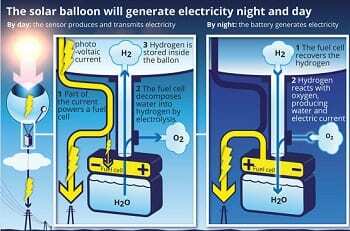 As such, small energy generators, such as solar balloons, could become a very valuable tool for many countries.